You’d never know it from mainstream marketing, but the knowledgeable enjoyment of good wine is a multicultural experience and there are great wines at every price point. The industry does a great job of portraying oenophiles, sommeliers, vintners…every aspect of wine ownership, production and distribution of wine…as an elite–and white–experience. It never has been just that. 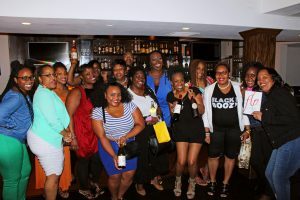 Here in RVA, a new brand–Black Girls Wine–is exposing new and seasoned generations of Black women to curated experiences of wine grown, harvested, imported and created by Black wine professionals. Like music, good wine is colorblind, even if the industry is not– yet. THRIVE is helping to nourish that conversation in RVA and beyond. 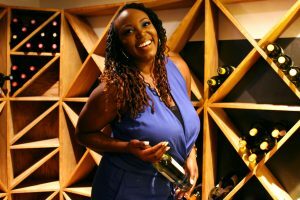 We spoke with Shayla Varnado about her lifestyle brand, which offers a triad experience–a monthly curated wine-centered box of joys, a weekly Facebook broadcast about living the grape life and wine events and tours. 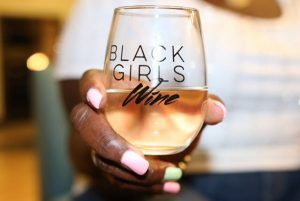 WHAT IS BLACK GIRLS WINE (BGW)? Black Girls Wine is an experience. It’s a lifestyle brand that was created to bring black girl magic to the wine world and change the way women of color experience wine. I wanted to create a space where Black women feel celebrated and Black wine makers have a platform where they can be discovered and supported. HOW AND WHEN DID YOU FALL IN LOVE WITH WINE? I honestly fell in love with wine after college. All of my close friends are much older than I am and that’s all they drank. So, as I started to “wine down” with them after work and on weekends, my pallet expanded quickly. I fell in love with the experience first and wine second. It’s that experience I wanted to share with other Black women. HOW DID YOU DEVELOP THE BUSINESS CONCEPT? The idea for BGW came to me; I wasn’t really looking for it. A friend of mine asked me to sell wine. I declined because I already had a successful business and I wasn’t interested in making someone else rich. 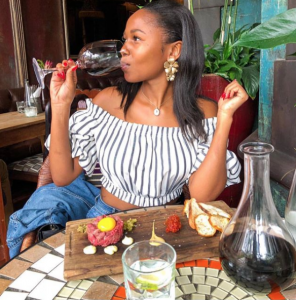 But, I became curious about the business of wine, did some research and realized that African-Americans are rarely engaged in the marketing, branding, and experiences offered from the wine industry. I saw a gap and wanted to fill it with creative experiences that would fit into Black culture. WHAT ARE SOME OF THE CHALLENGES/PAIN POINTS YOU’VE FACED DEVELOPING THE BRAND? The monthly wine accessory subscription box requires a lot of attention to detail, planning and time. Getting comfortable with pricing the wine box was my first BIG hurdle. Talking about the wine box directly in front of the BGW audience was the next challenge because the RVA audience needs developing versus a ready-made target market like Atlanta. It’s a two-pronged approach to both develop and locate her–the BGW audience. WHAT IS THE MOST REWARDING ASPECT OF THE BUSINESS? I love curating and developing experiences for women. I enjoy seeing their faces light up when they open their subscription boxes, walk into a Black Girls Wine event, or win a giveaway from us. All of the women who’ve been a part of a BGW experience, whether they’re a subscriber or have been to an event, have thoroughly enjoyed themselves. That makes all the hard work and planning worth it. DO PEOPLE ASK YOU WHY YOU ARE FOCUSING ON BLACK WOMEN INSTEAD OF BEING INCLUSIVE? IF SO, HOW DO YOU RESPOND? Did you know there’s a wine brand called White Girl Rose? Something like 99% of the marketing and branding for wineries and wine stores do NOT include people of color. Most people who are not Black who learn about my business ask the same question when they hear about BGW “Oh there are Black wine makers?” They have no idea just how left out of the mainstream conversations about wine we are. BGW is not about exclusion. It’s about celebrating the women who are overlooked, undervalued and often completely ignored. If someone asks me about inclusion I ask them to name a Black label or brand that’s being advertised in the mainstream market. They never can. HOW DO YOU COMBAT STEREOTYPES OF EXCUSIVITY TO MAKE KNOWLEDGEABLE ENJOYMENT OF WINE ACCESSIBLE? The weekly Facebook show I do every Wednesday totally combats the stereotype of fine wine connoisseurship and enjoyment as something that only rich people can access! I love going live and talking to people from around the world about what I’m drinking while talking about cultural and social news. It makes the experience of drinking wine more approachable and people love when I select a wine that they can find and try as well. #WineDownLIVE is my way of making the wine down experience more fun! HOW DO YOU SEE THE BRAND GROWING/EXPANDING? Here’s my vision: A few years and a few thousand subscribers from now, I am creating experiences for Black women around the world. Black Girls Wine is co-sponsoring the BET awards, Essence Black Women in Hollywood, Essence Fest, and even has our own world tour! BGW is a globally recognized and respected brand that empowers and inspires Black women–all women, ultimately–to celebrate themselves. We partner with wineries and sommeliers to curate signature experiences so that even when we can’t be there women can still be a part of what we’ve created. This future is very real for me! WHY IS WINE SO IMPORTANT? Wine is important because it gives the drinker an opportunity to step outside of her own world. You can experience France, Spain, Italy, Australia, or Germany with just one sip! It’s the chance to dance with history and try something new while getting a little tipsy if you dare to explore until the bottle is empty! IF BGW WERE WINE, WHAT WOULD IT BE? I would compare BGW to a Pinot Noir. It pairs well with many experiences, many people, and has so much richness to offer that you just can’t turn away. FINISH THIS SENTENCE; WINE IS…? required, recommended, and highly suggested for everyday adulting. SO, HOW DID YOU COME TO BE INVOLVED WITH THRIVE? Thrive was recommended to me by a fellow entrepreneur friend and I loved the idea of having a mentor for my business. It has turned out to be a huge, unexpected blessing! WHAT DID WORKING WITH THRIVE DO FOR YOU/THE BUSINESS? My THRIVE mentors have been phenomenal. They see things in me and my business that sometimes I simply can’t see. The guidance and opportunity to work closely with a business development professional as I take such big steps has been amazing. Sydney has been like the cardiologist for BGW; she keeps me (the heart) pumping with suggestions and tips! Bryan has been like a therapist for my business; always pushing me to think beyond my ideas to what’s next. They’ve both been amazing! WHAT INSIGHTS CAN YOU OFFER OTHER ENTREPRENUERS WHO ARE INTERESTED IN WORKING WITH THE THRIVE NETWORK? Sign up even if you think you don’t need it. There’s nothing like having another pair of eyes on your business with the same goal in mind— to see you grow! Wine lovers know that the aftertaste or “finish” is the most important factor in judging a wine’s character and quality. Checking in with Shayla’s primary THRIVE mentor, Sydney Lester, we discovered that the BGW brand has “finesse;” it’s well-balanced and high quality. Sydney says that Shayla and BGW are poised for success. My own taste? In wine–as in life–wring every bit of pleasure from each sip you take. The best thing is that practice makes perfect. Salud!